This year sees the 150th Anniversary of Canada’s founding as a nation, so on this event we also look back fifty years to the special cruise sailings that were offered in connection with Expo ’67 that included stays on board in Montreal. This year will also see a boom for Montreal and Quebec, with traffic up about a third. Elsewhere, Oceania Cruises will be basing their Insignia at New York for the late summer this year as well as the summer of 2018. Finally, in a first for the line, Azamara Club Cruises has announced a series of eleven Alaska cruises for 2019. This year marks the 150th Anniversary of Britain’s former North American colonies uniting to form the Dominion of Canada. On the 100th Anniversary, fifty years ago, all eyes were on Montreal and its world fair Expo ’67, with quite a few interesting ships planning to sail into Montreal and a couple of larger ones into Quebec,139 miles downstream. Most important of these was the French Line’s five-year-old 66,343-ton 2,044-berth France, which departed Le Havre on May 4, 1967 and arrived at Quebec on May 9. Leaving the Port of Quebec four days later, she arrived back in Le Havre on May 18th. Following this voyage, the France made four of her usual round voyages to New York, departing Le Havre on May 20, June 2, June 16 and June 30. On July 13, she departed Le Havre on another westbound voyage to Quebec, arriving on the morning of the 18th and New York, arriving on the afternoon of the 20th. This clearly never happened as, forgetting the bridge height, the water at Ile Notre Dame is far too shallow for such a large ship. 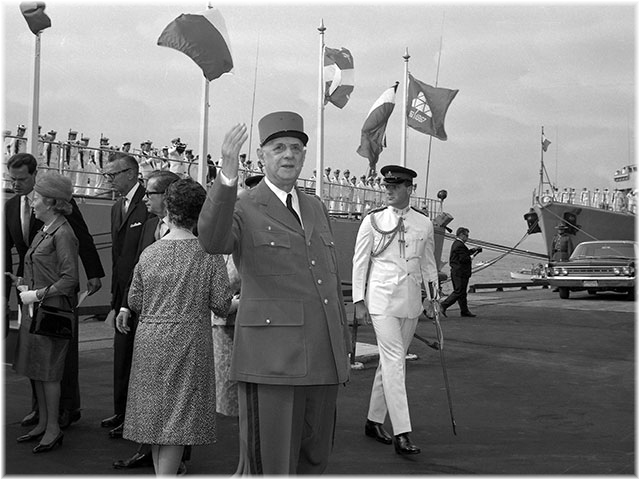 Oddly, although the France made these special voyages to Quebec in 1967, French president Charles de Gaulle chose instead to sail in the cruiser Colbert, leaving Brest on July 15 and calling at the French islands of St Pierre et Miquelon on the 20th, before finally arriving at Quebec on the 23rd. From here, de Gaulle went on the next day to make his famous “Vivre le Québec libre” speech in Montreal. Fifty years and two referanda later, Quebec is still part of Canada. The France’s schedule for the rest of the season consisted of crossings to and from New York, but the company sent its white-hulled 20,477-ton 723-berth Flandre, usually engaged on the French West Indies Line, on two summer voyages from Southampton and Le Havre to Montreal. Unlike the France the Flandre was able to reach Montreal. 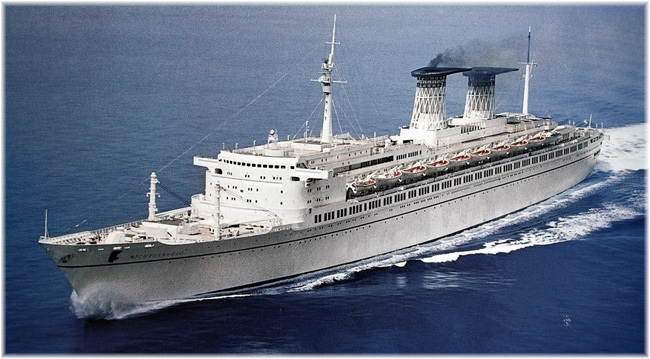 Now surplus as a Transatlantic liner, the Flandre was sold to Costa Line after closing out her 1967 season. Among other notable ships sailing to Montreal that summer was Zim Lines 25,320-ton 1,090-berth Shalom, which departed New York on May 20, called at Boston, and spent thirteen hours at Quebec and three days and two nights on Montreal. The Shalom soon became Hamburg Atlantic Line’s Hanseatic and five years after Expo, Home Lines’ Doric. The Italian Line sent their two-year-old 45,911-ton 1,775-berth Michelangelo on a special sailing from Italy and the Mediterranean to Quebec, where she arrived on May 29. She then left on May 31 on a 3-day cruise to New York. Holland America Line participated too, with its St Lawrence liner, the 893-berth Maasdam. A special cruise was offered from Montreal to New York on which embarkation occurred on June 22 for three nights on board for Expo ’67 before sailing on June 25 for New York. The Maasdam then spent the nearly twenty years from 1968 until 1987 as Polish Ocean Lines’ St Lawrence stalwart Stefan Batory. Cunard Line then sent its 21,717-ton 929-berth Franconia on a cruise from New York on July 18, arriving at Montreal via Quebec on the 23rd. This was followed by a cruise from Montreal on August 7, arriving at New York four days later. These cruises could also be booked as 4-day one-way voyages. 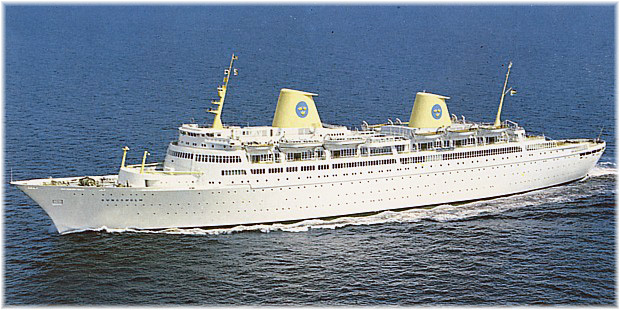 Moore-McCormack Lines’ sent its 26,614-ton 557-berth sister ships Argentina, which sailed from New York on August 12, and Brazil, which left on September 1, on two special cruises to Gaspé and the Saguenay, spending fifteen hours at Quebec and three full days at Montreal to take in Expo ’67. 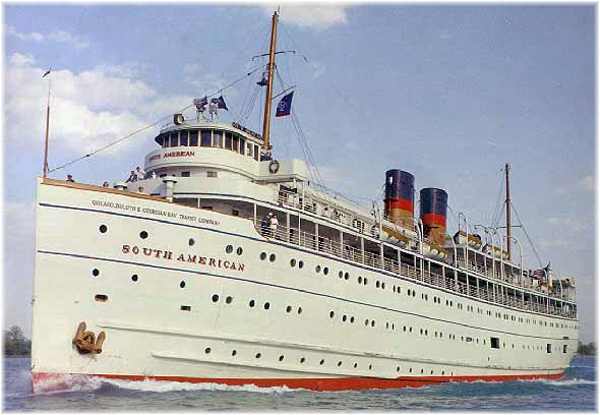 Finally, from the Great Lakes ports of Detroit and Cleveland the Georgian Bay Line sent its 2,662-ton cruise ship South American on seven round-trip cruises that included Expo ’67. These 8-night voyages included 3 days and 2 nights in Montreal for Expo ’67, and ran from June through September, after which the fifty-three-year-old ship was sold. Another old ship was engaged in a stationary role at Expo ’67, when Peninsula & Occidental Line’s 4,945-ton former Miami-Nassau cruise ship Florida was used as a floating hotel and bar called Le Pallais Flottant, anchored at Ile Charron. The thirty-five-year-old Florida was one of the last of the old-style Miami-based cruise ships and was sold for scrap soon after Expo ’67. Not running cruises to Expo ’67 but worth mentioning are Canadian Pacific’s 27,284-ton 1,048-berth Empress of Canada and 25,585-ton 1,058-berth Empress of England, which operated the regular liner service between Montreal and Liverpool. Their absence from the cruise scene was made up for by the fact that Canadian Pacfic had a pavillion at Expo ’67. Five years later, in 1972, the Empress of Canada became Carnival Cruise Lines’ first ship, the Mardi Gras,and every Carnival ship since has had an Empress Deck. Fifty years later, in 2017, many voyages are planned to and from both Montreal and Quebec. Today, Holland America leads the pack by far, with its usual Montreal turnaround ship, another Maasdam, being a 1,266-berth ship that entered service in 1994. 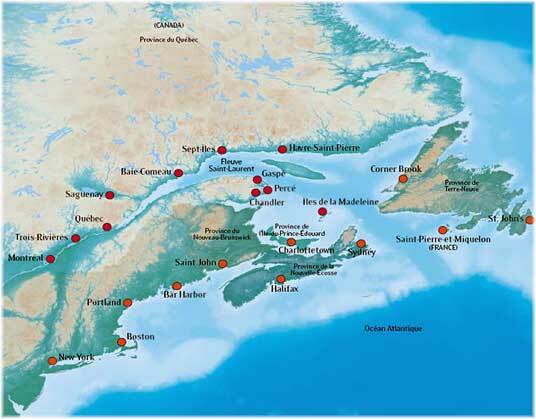 Twenty cruises are scheduled from Montreal by the Maasdam (8), now joined by the 1,348-berth Veendam, which previously turned at Quebec (9) and the 1,404-berth Rotterdam (3), as well as two cruises from Quebec by the 1,848-berth Zuiderdam. Next up are four departures by Oceania, with its 684-berth Insignia and four by Silversea, with three by its 388-berth Silver Whisper and one by its new 596-berth flagship, the Silver Muse. Then, with three departures each are Regent Seven Seas, with two by the 708-berth Seven Seas Mariner and one by the 490-berth Seven Seas Navigator, and Viking Cruises, with two by the 928-berth Viking Sky and another by her sister ship Viking Sea. 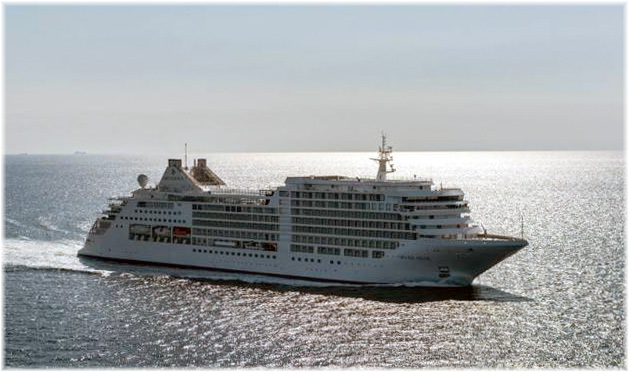 Two departures each will be offered by the 2,050-berth AIDAdiva, the largest ship to make it to Montreal this year, and 450-berth Seabourn Quest, plus a single departure by Phoenix Reisen’s 1,176-berth Artania. Inward calls will also be made at Montreal by Hapag-Lloyd Cruises’ 408-berth Europa on July 21, CMV’s 848-berth Marco Polo on September 15 and Saga’s 706-berth Saga Sapphire on October 1. And just as the South American offered small ship cruises from Great Lakes ports in 1967, fifty years later the 210-berth Pearl Mist and Victory 1 will each be offering Great Lakes cruises, primarly between Toronto and Chicago, but also Gulf of St Lawrence cruises that include Montreal. At Quebec, bigger ships such as Princess Cruises’ 3,114-berth Crown Princess, Norwegian Cruise Line’s 2,576-berth Norwegian Dawn and Royal Caribbean’s 2,000-berth Vision of the Seas will each offer two departures this year. 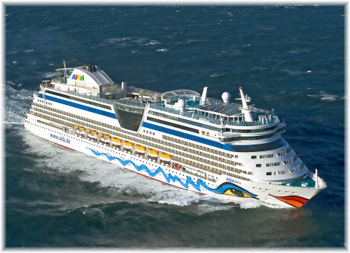 Norwegian will also make three inward calls at Quebec, two by the 2,466-berth Norwegian Jade and one by the 2,394-berth Norwegian Gem, all in October, while the 2,158-berth Celebrity Summit will call twice from New York and P&O Cruises’ 1,994-berth Arcadia will arrive from Southampton, in late September and October for the autumn leaves. 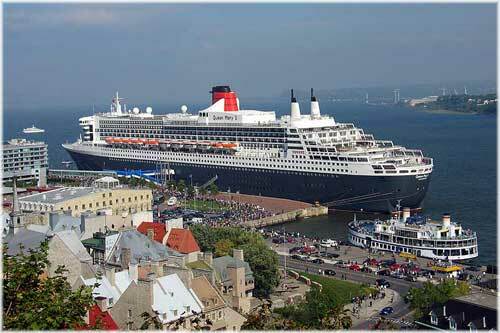 Finally, Cunard Line’s 149,215-ton 2,695-berth Queen Mary 2 will call at Quebec on September 29 this year as part of her annual cruise from New York to Quebec, in which it is possible as well to book Transatlantic passages between Southampton and Quebec via New York. Like the s.s. France fifty years earlier, the Queen Mary 2 is the largest passenger ship to serve Quebec, by tonnage, and unable to reach Montreal because of her size. This year is predicted to be a very strong year for St Lawrence ports, with more than a third increase to 346,000 passengers (and crew) from the 252,000 who arrived in 2016. Part of this growth is driven by operators branching out from the peak fall foliage period. 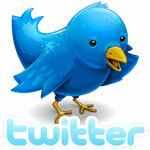 This follows the lead of Holland America Line, which now routinely operates throughout the summer. Smaller ports in the St Lawrence will also get more calls and 2018 is projected to be a strong year too. 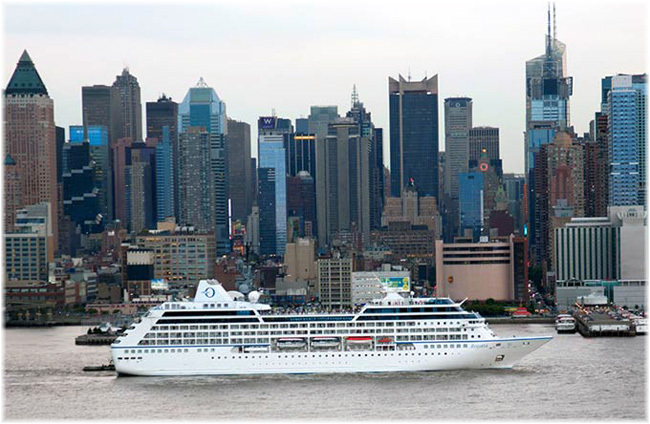 Oceania Cruises has chosen to run its first series of sailings from New York City from next year. The company claims it will be the only upmarket cruise line to base itself in New York, with more than twenty cruises planned for 2017 and 2018. The Insignia will operate from Manhattan’s west-side cruise terminal at 48th Street, primarily with voyages to New England, Canada and Bermuda, which will have the usual overnight calls. The 2017 season will include eight 10- to 11-day cruises running through to October. In early August the Insignia will arrive at New York from Reykjavik for a series of four cruises from New York to Halifax in Canada and St George’s in Bermuda. This will be followed in September by another series of four cruises, this time between New York and Quebec and Montreal on the St Lawrence. In 2018, this will be followed by several 10-night cruises from New York to Halifax and St George’s and/or Hamilton, Bermuda followed by another series of 10-night cruises between New York and Montreal in September and October. These new Insignia itineraries may remind some of the combination New York, St Lawrence and Bermuda cruises that were once offered by the Furness Bermuda Line’s 414-berth Ocean Monarch and later by Flagship Cruises in the 713-berth Kungsholm. Azamara Club Cruises announced last week that it would be offering eleven Alaska cruises in 2019, marking the line’s first season there. Voyages will range from 8 to 10 days and take place from May to September, with Vancouver being the base port. The 694-berth Azamara Quest will offer seven departures from Vancouver and another four from Seward, Alaska. Three of these will be round voyage cruises from Vancouver. The four 8-night Vancouver/Seward cruises will be matched with four 10-night voyages in the reverse direction. Azamara’s Alaska itineraries will feature more time in ports than is common on these cruises, including several late-night stays. During the 10-night voyages, Quest will stay in Juneau until 10 pm and in Skagway until 11 pm. Rocky Mountaineer pre- and post rail tours will also be offered as add-ons before or after these Alaska cruises.